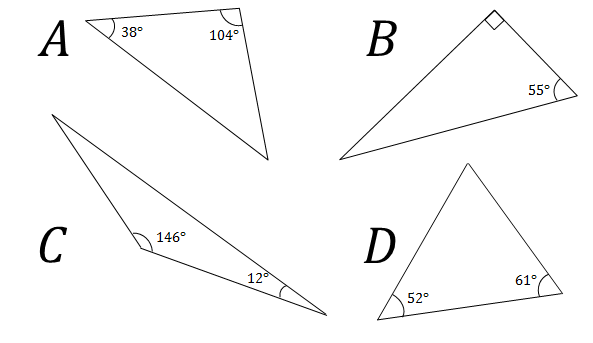 When comparing the lengths of a triangle's sides, all three sides may be equal, two sides may be equal, or all three sides may be different lengths. This observation forms the basis of a classification system. In an equilateral triangle, all sides are equal in length. ("Equilateral" is derived from two words: "equi" meaning "equal," and "lateral" meaning "sides.") Since equal sides in a triangle have equal angles opposite to them, all the angles of an equilateral triangle are equal as well, measuring 60 degrees. Equilateral triangles are discussed further in Properties of Equilateral Triangles. An isoceles triangle is a triangle with two equal sides (and consequently two equal angles). The two equal sides are opposite of the two equal angles. Since any two sides of an equilateral triangle are equal, all equilateral triangles are isosceles triangles, but isosceles triangles are not necessarily equilateral. Isosceles triangles are discussed further in Properties of Isosceles Triangles. In a scalene triangle, all sides have different lengths. If a triangle is not isosceles, it is a scalene triangle. A degenerate triangle is a triangle where all vertices are colinear, so the lengths of two sides add up to the length of the third side. Such a triangle doesn't "look" like a triangle. It looks a bit more like a line segment. 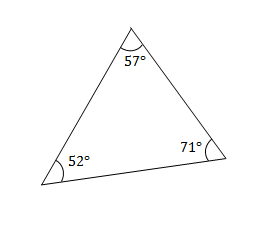 Classify a triangle on the basis of sides if it has angles measuring 50, 60, and 70 degrees. Classify a triangle with sides 2, 3, and 6 units in length. These dimensions are all different, which appears to represent a scalene triangle. 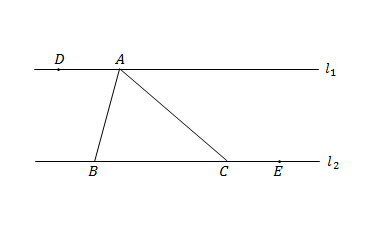 However, such a triangle cannot exist due to the triangle inequality. In an obtuse triangle, one angle has a measure greater than \(90^\circ\). In a right triangle, one angle has a measure of exactly \(90^\circ\). In an acute triangle, all three angles measure less than \(90^\circ\). 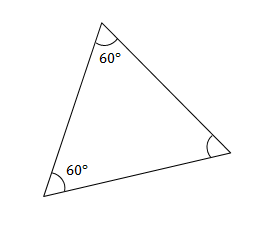 In an equiangular triangle, all three angles are \(60^\circ\). Note that an equiangular triangle is also an equilateral triangle. The three angles in a triangle always add up to \(180^\circ\). The three angles of an equilateral triangle are all equal to \(60^\circ\). An isosceles triangle has a pair of equal angles. Which of the following triangles is an isosceles triangle? 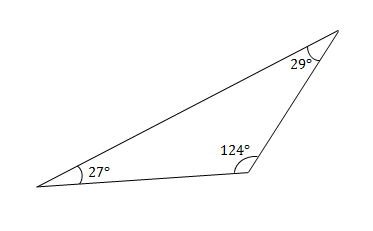 The ratio of the three angles that form a triangle is \(1:2:3\). Classify this triangle. In the figure below, the lines \(l_1\) and \(l_2\) are parallel. Given \(\angle BAD=75^\circ\) and \(\angle ACE=150^\circ\), classify \(\triangle ABC\). John drew a triangle such that all the angles, in degrees, were perfect squares. What was the largest angle among them, in degrees?